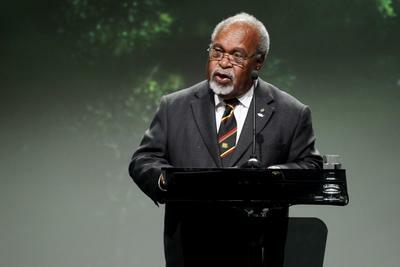 Papua New Guinea’s political dramas have intensified in the 10 weeks that Prime Minister Sir Michael Somare has spent in intensive care in Singapore’s Raffles Hospital. Only on 22 June did Arthur Somare, the Minister for Public Enterprises, tell Parliament that his 75-year-old father had undergone a heart valve operation plus two further emergency operations. Last Friday, 24 June he stated that the family had decided he would be told he could not return to his job and should resign, and late last week the government made a snap decision to adjourn Parliament for five weeks till August, which will give it some time to resolve its internal divisions. In May a government minister was chastised for insensitive ambition for angling to replace the nation’s founding PM while he was ill, but since then the power plays are becoming increasingly evident. The current Opposition is not the main force here — it makes up only 21 of the 109 MPs, and a vote of no confidence is unlikely. Conflict has emerged both within and between the dozen coalition parties, most who have been together since 2002. Somare’s National Alliance (NA) is still the largest party with about 40 MPs, but in the event of a mid-term vacancy the party’s leader is not guaranteed the prime ministership; MPs would have an open vote. The political outcome of these struggles cannot be predicted at this stage. What we are seeing is a currently-muted return to the pattern of ‘horse trading’ between several candidates, with several parties already clearly divided. Some current ministers could also move to the Opposition. The unfolding situation can best be understood by briefly examining the cast of characters. As flagged previously in East Asia Forum the Somare family has been embroiled in Leadership Code cases initiated by the Ombudsman Commission. In April the PM was briefly suspended from duty for failing to lodge annual income and asset returns over many years, and in July his son Arthur faces a tribunal on charges relating to alleged misuse of electoral-district development funds. Such funds are poorly-controlled honey traps for MPs, and since 1976 some 94 leadership cases have been commenced. PNG’s politicians are gearing up for the mid-2012 elections and building up political and financial credit for themselves and their parties. The situation has been quite fluid since a Supreme Court decision in July 2010 allowed MPs to swap parties, and several parties in government have grown as MPs hopped around the floor, some more than once. The NA could remain the largest party after the next election, but meanwhile faces leadership struggles. The party’s constitution denies Sir Michael a third term as PM, but observers believe that ‘the old man’ has hung on because his family wants Arthur to succeed him. Arthur has had carriage of the $15 billion Liquefied Natural Gas (LNG) project and in Parliament he constantly extols the riches it will bring. But he is often accused of arrogance, and the idea of a Somare dynasty is being attacked. This helped precipitate the split in the NA July last year. Moreover, Arthur Somare is not one of the NA’s four regional deputy leaders, who under party rules should provide the next party leader. When Sir Michael stood aside last December because of his Leadership case he appointed Sam Abal Acting PM. Son of a respected politician, and trained in Australia as a diplomat, Abal was Foreign Minister from 2007. He is respected as a bureaucrat but is not a flashy politician. Although seen by some observers as lacking political toughness, while provincial affairs Minister in 2005 he took principled action to improve governance, resisting strong pressure from above. His current manoeuvres show a capacity for bold action. Another person to watch is the NA’s longest-serving regional deputy leader, Patrick Pruaitch. Forestry Minister until 2007, he is allegedly implicated in a secret US$40m fund held in Singapore, derived from logging companies. He became Treasurer in 2007, although lost the position for 11 months and is still facing a Leadership Tribunal. Pruaitch is seen by the Somares as a cousin, and Abal recently reappointed him Treasurer. Commentators say Abal wanted the NA to regain control of Treasury in the run up to the 2012 campaign. The NA’s Highlands region deputy leader is Don Polye, who was also Deputy Prime Minister. An engineer, Polye, as Works and Transport Minister, gained enormous power after 2002. He excelled in Parliament and over the years built huge political credit, especially in the Highlands. Australian educated, Polye is a smooth speaker and works well with foreign governments and aid donors. Last year Polye, a frankly ambitious man, argued that the NA needed a new leader and let it be known (to no avail) he was interested. Polye’s name was also damaged in the 2007 election, which he won with such a landslide that an appeal judge deemed it was rigged. After spending huge funds in his electorate he was re-elected in a rather violent by-election in November 2009, and other Highland leaders clearly see Polye as a major threat. In December 2010 Abal removed Polye from his power base in Works and Transport to the Foreign Affairs portfolio, only to be sacked by Abal this June for alleged insubordination. The NA’s deputy leader for the New Guinea Islands is Planning Minister Paul Tiensten. Although not tactically-astute, he has had enormous power in the disposition of the development budget and funds to MPs from the country’s ongoing mining boom ‘windfalls’. Some of his spending has been seriously challenged, and last year NA’s strong Islands Division sought to expel him. Tiensten was also briefly suspended in 2010, but has strong connections with the Somare family who have kept him in the fold. The coalition’s second-largest group is the United Resources Party (URP) led by William Duma from the Western Highlands, Minister for Petroleum. Duma has been plagued by poor performance and Abal removed him from the ministry in mid-June. The URP is now deeply divided, opening the possibility it will be absorbed by the NA — which would then owe their promotion to Abal and NA, who would no doubt hold URP members beholden to it for their ‘promotions’. The Peoples National Congress (PNC) is the third major party in government, having grown rapidly since July 2010. Its leader Peter O’Neill was close to PM Somare while leading the Opposition from 2004, and after 2007 he became Public Service Minister. Now reputedly a very wealthy man, O’Neill is the best parliamentary speaker and tactician in government, though he remains under a cloud from the 2002 National Provident Fund Commission of Inquiry. O’Neill used his time as Treasurer in recent months to build political support, but in mid-June Abal sacked him. Some journalists speculate that O’Neill could withdraw his party from the NA coalition, positioning himself to win an open vote for PM. These are the key characters and parties around which the narrative of PNG’s politics is unfolding. The outcome remains far from certain. Parliament was due to sit again for three weeks in July, and the constitution theoretically allows the Opposition to bring a vote of no confidence until 7 August, but that is unlikely given the PM’s ill health. A VNC is also unlikely because a number of MPs who crossed the floor in July 2010 have returned to government, often to different parties. One Minister who crossed back is Charles Abel, whose recent appointment as Minister of State Assisting the PM is strongly resented by other coalition MPs. The Opposition’s leaders since 2007, former PM Sir Mekere Morauta and his Deputy, Bart Philemon, stood aside in April in order to allow generational change, and inducted Belden Namah and Sam Basil to replace them. Namah was prominent while a young army lieutenant in removing South African mercenaries during the 1997 Sandline crisis, and since then has become wealthy from logging in his West Sepik Province. He was Forests Minister from 2007, which gives him demerits with civil society groups. Namah crossed the floor in July 2010 and after fiery speeches alleging corruption in government the PM Somare warned him not to break cabinet secrets. Basil is a businessman from the mining area of [Bulolo], a man of principle who understands the issues of governance as promoted by aid donors and civil society and environmental groups. These first term MPs are strongly disliked by the old guard in government, and are unlikely to be able to form a new government this year or next. Sir Puka Temu, the Deputy PM who quit the government last July and was named then by Morauta as alternate PM has been calmly taking an elder statesman role while the PM is incapacitated. Government has been in a state of policy paralysis this year and state services continue to decline. Angry landowners are blocking some of the construction at the LNG sites in the Southern Highlands and Gulf provinces, and resource projects in Madang province are under court challenge. The new Police Commissioner Tony Wagambie admits major problems of police indiscipline; brutality by members of the under-resourced and trained force is a major public concern. The Governor of Morobe, Luther Wenge, is leading a renewed push against the Ombudsman Commission. A challenge is under way questioning the constitutionality of the process used for swearing in Abal as Acting PM and Sir Arnold Amet as his Attorney General last December. The National Alliance is considering a resolution from Mr Polye’s Highlands region to expel Sam Abal from the party. Meanwhile, the capital Port Moresby faces a building boom induced by the LNG project. High inflation is making life difficult for the little people. Government services are declining across most of the country. Resentment of the incumbent government is found across the country, with constant allegations of corruption, so factors such as these could once again lead to very high electoral losses by sitting MPs in 2012. Meanwhile, on 14 June Sam Abal reassured Parliament ‘there’s a lot of things moving, a lot of things are coming up, for once in this country stabilisation has occurred and investors have confidence in this country’. This is an edited version of a post originally found here on East Asia Forum. Dr Bill Standish is Visitor at the School of Culture, History and Languages, College of Asia and the Pacific, Australian National University, and is a former lecturer at the University of Papua New Guinea.